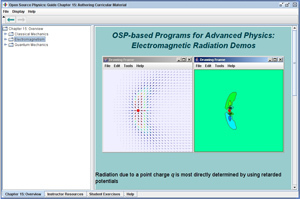 The Launcher program shown distributing curricular materials on radiation from point charges. The Launcher program is an OSP tool that addresses the problem of how to distribute OSP and Ejs programs and curricular modules. Launcher is a Java application that can launch (execute) other Java programs. We use Launcher to distribute OSP and Ejs collections of ready-to-use programs, documentation, and curricular material in a single easily modifiable package. Delivering curricular material in Launcher packages has the advantage that the material is self-contained. The material is only dependent on having a Java VM on a local machine and not on the type of operating system or browser used. Packages created with Launcher are executed by double-clicking the file. Launcher then automatically loads the specified programs and resources. 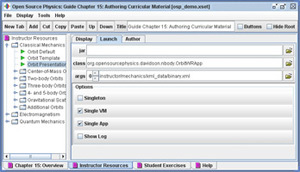 The Launcher program displays curricular units by using a tree structure to organize the material according to topic, course, etc., as shown in the Figure above. Materials can also be organized into one or more tabs, each of which displays an Explorer pane and a Description pane within Launcher. The Explorer pane allows users to easily navigate the tree-based curricular material and launch the associated programs. Selecting a tree node (single click) displays its associated html or text description in the Description pane. Double-clicking a folder node expands or collapses the contents of that node, while double-clicking a launchable node (depicted with a green arrow) will launch a particular program. The Launch Builder program being used to edit the package osp_demo.jar. The LaunchBuilder program is an OSP tool that allows any package created with Launcher to be edited and customized. From an open package, selecting the File | Edit menu item will open the package in the LaunchBuilder program and allow for editing of the materials. By using the program LaunchBuilder, we have made it easy for end users to modify, author, and distribute their own Launcher-based curricular material without recompiling Java code or creating jar files. Launcher-based curricular material is organized using an xml configuration file referred to as a TabSet and having an XSET extension. This allows authors to have the program show a pre-defined set of parameters and also a simplified user interface without parameters. A curriculum author (or advanced user) can edit the model’s parameters and save them in an xml data file.